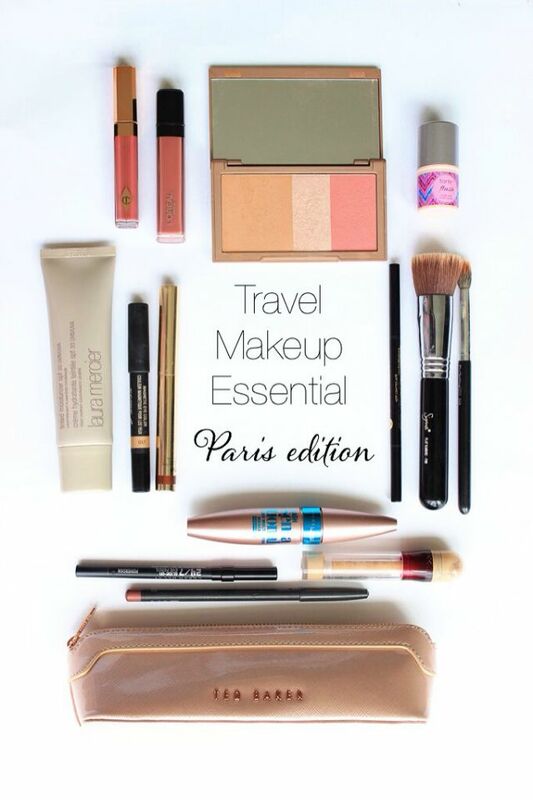 Like most people, summer brings in quite a lot of excitement in terms of traveling, so I thought I’d share whats in my ‘travel makeup bag’ from a 3 day trip to Paris . I have never been a travel light kind of a person I love having options but after having a kid, things aren’t exactly how I’d like, so packing light is the only option that is left especially when it comes to makeup. Pencils, stick eyeshadows, and basically anything that is in a compact/travel friendly packaging accompanies me. To start with base I love my Laura Mercier tinted moisturiser, for its perfect color match, sheer yet evening-out-ness, and of course for the SPF. For concealer there is none other than my favourite maybelline age rewind concealer. By terry ombre bronze moon and Nudestix in gilt have been my absolute favourite travel companions. Gilt being more day time appropriate and bronze moon for a sultry night out, haha. Mascara wise anything water proof is the best option and nothing better than Maybelline lash sensational. And Urban Decay perversion eyeliner. Soap & Glory brow archery. Urban Decays naked flushed palette is the bested travel choice as it has everything in one compact case, and I absolutely adore the shades in it. And out of the habit of having options I like to keep a small stick blush this one is Tarte Flushed Cheek stain, which does doubles up as a lip stain as well. I won’t lie I like to keep it safe with my favourite neutrals, Mac dervish lip-liner, Charlotte tilbury High Society lipgloss and Loreal cream lipgloss in I got the power. Sigma F80 Flat top kabuki is the best foundation brush you will ever use if you haven’t tried it yet, you need it in your life, Mac 286 stippling brush and few Q-tips. Even though it seems like a long list of things but I promise they all fit into my pretty Ted Baker Pencil case, which I’m in LOVE with, except for the UD Naked Flush palette. What are your travel must-haves? Are you a hoarder when it comes to packing or you prefer keeping it light?